When you have an old item to sell and need quick cash, approaching a local antique dealer―whether in a standalone shop or an antique mall―can offer an easy solution if you're not interested in trying out a local online venue like Craigslist. Selling locally saves you from paying fees to sell online, collecting check and credit card payments from buyers, and all the hassles associated with packing and shipping antiques and collectibles. And, of course, worrying about items getting damaged in transit is a major consideration if they’re particularly fragile. Knowing how to sell antiques, including what to do, and what to expect, before you approach a dealer can make a big difference in how well your deal goes down. 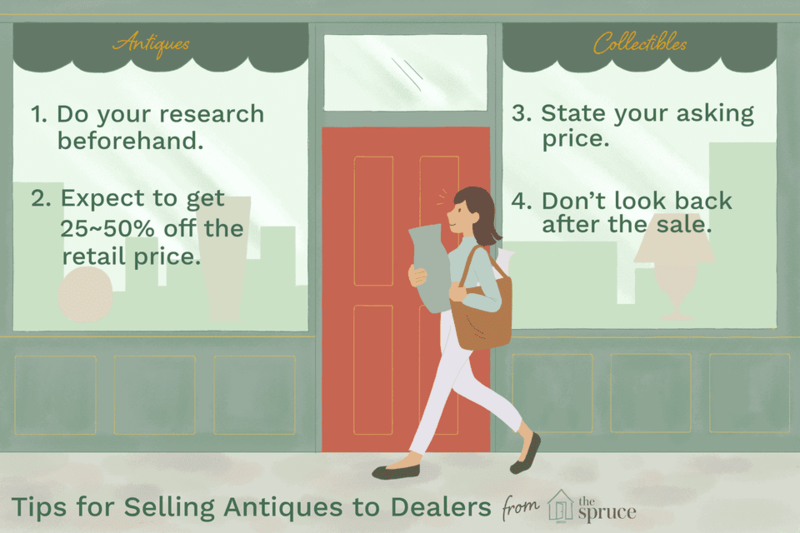 Peruse the following tips for some hints to prepare you for a successful sale to an antique dealer in your own hometown. Don’t expect an antique dealer to tell you everything you need to know about your antique or vintage items before buying it from you. That’s not going to happen. They’re not keen on giving evaluations away for free, and rightly so. Most seasoned pros have likely been burned before by people who took advantage of their knowledge in the past. It's quite a slap in the dealer's face when someone takes up their time as a potential seller only to walk away with the item intending to sell it elsewhere. Also, if you go to the shop not knowing anything about what you have or a bit about how much it’s worth, you’re potentially cheating yourself out of a lot of money. Do some research to determine the value before you ever attempt to sell an antique. Be sure to evaluate the condition of the piece closely, too, since that has a major impact on how much it will be worth. This will help you get a ballpark idea of what you might get for the item through a direct dealer sale. After doing that all-important pricing research and honestly assessing the condition, you’ll be walking into the dealer’s shop with a good idea of how much your item is worth. That's great. But don’t be surprised when they’re only willing to pay 25 to 50 percent of what you've found to be the current market value. Shop owners have overhead expenses, even those selling online, and they often have to wait months or even years for the right customer willing to pay top dollar to come along. You’re getting the benefit of quick cash with minimal hassle, and there’s a price to pay for that. In many instances, it's totally worth it. Many antique dealers require the seller to state their asking price as a starting point for negotiation. Don’t be surprised or insulted, if that turns out to be the case. Walk into the shop knowing the least you’re willing to take for the item you’re looking to sell. You can start negotiations somewhat above that benchmark to see how high the dealer is willing to go. If you luck out, your item may be something the shopkeeper has a ready market for or wants to add to their personal collection so they’ll be happy to take it at your starting price. If not, they will likely make a counteroffer and you can negotiate further from there. Before you sell an item, especially if it’s a family heirloom, think long and hard about whether you really want to part with it. You can’t count on it still being available if you change your mind and go to buy it back from the owner. The dealer might not be willing to sell it back for the price they paid you anyway. That’s their prerogative as the current owner of the piece, and there should be no question that they bought it from you to turn a profit. You may be better off pawning the item for a loan at a shop that deals in antiques and collectibles if you need money and aren't sure about completely letting go just yet. Just know that if you miss a loan payment to a pawnbroker you'll forfeit your rights to ownership. Don’t kick yourself for not finding a way to hold out for top dollar when selling either. Once a deal is done count your blessings, and your cash, knowing that someone was willing to quickly take the item off your hands. Part of letting go of an antique is moving on after the sale and not looking back.